I'm trying to get a complete collection of the 'Abacus' books, but i'm missing a few, do any of you have any to swap with my 'doubles' ? 14 and 15, if these exist ? I think the only duplicates I have are 4 and 5. I don't have them all, will post back what I have. Though its bumping a old thread, It is still something valid. Some others might be up for swaps or trade as its been a while.. I've not seen anything higher than 13. I have the complete 1-13 here and I know I have spares of a few of these in storage. I'll pop out and take a look this morning for you. Just popped out to have a look. I have 4, 7 and 8 as duplicates. Spiny: PM on its way to you. If anyone wants 4 (Machine Language), let me know. If someone is willing to sell them at a reasonable price, I'm all ears. If has any of those issues then let me know, happy to trade with issue 4 & 5 is anyone needs them. I haven't seen '00' or the GFA books, maybe they were a different series even if they were by Abacus ? "00 - Presenting The Atari ST" is definitely in the series as I have it at home in my set. Can take you a picture if you like? Here you go In my time stalking eBay, I think I've only ever seen one other copy of #0 for sale. I was also never sure if #13 was the last one, but I've never seen anything later than that. I still need to find some missing books for my collection, will try and take a image later of what I have. These are the ones I have currently. With thanks to Ticker, I now have a copy of '0' - interestingly, this ins a first edition and doesn't have a number on the spine like the one posted up there ^ does. This thread goes back a ways, but I thought I'd revive it. I've been searching for the GFA BASIC Quick Ref. Guide that was mentioned eartlier in this thread. While I haven't been able to find a real, printed copy of the book, I have located a pdf copy. Not my first or final choice, but I can confirm the book does exist. However, while it is from Abacus, and it is ST related, it doesn't look like the others or appear to be part of this series. 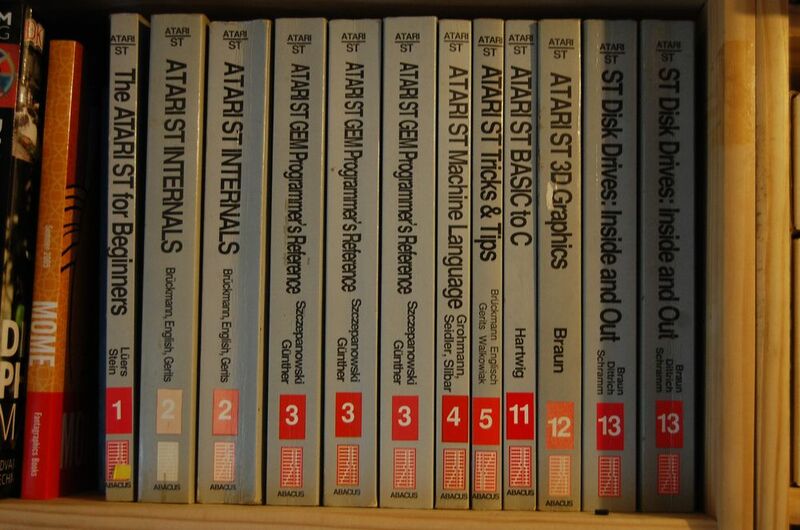 I'll also revive this thread by asking if anyone knows how many editions of volume 2 "Atari ST Internals" there were. I have the third edition, dated 1988, which has details of the blitter chip. I also have the machine language book, but as a hardback published in 1986 by First Publishing. Judging by the back cover, First Publishing also issued several other volumes from the series, albeit with some having amended titles.